Let’s define wind energy as the conversion of kinetic wind energy into electricity more easily to use and adaptable to other purposes. Usually this is done through specific equipment, such wind farms or wind turbines.Wind energy has the great advantages of being a renewable green energy that requires no oil or other fossil fuels to be generated, is present everywhere in the world, and requires relatively small areas to be implemented. The consequences on nature are usually much less problematic than other sources’ ones. In Italy, the use of wind energy is gradually increased over time, considering that according ENEA’s data from 2008 to 2009 there was an increase of 30% of electricity generated by wind farms. 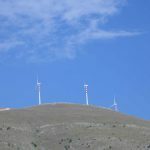 Despite this, the country is not at the top in Europe in this area: in fact we must say that for this type of energy to be considered profitable, certain wind conditions are required, which occur not on the whole peninsula but just in the south and on the islands . The situation is different in Europe, where the constants and strong Atlantic breezes, allow to make these investments with greater confidence: think that the strength of the wind in Denmark, produces electricity for more than a quarter of the nation needs, and aims to get to 50% by 2050.Even globally the eolic’s numbers are very interesting: the 2010 data tell us that 2.5% of the world”s energy needs is served by the wind, and it’s growing by 25% annually. The wind turbine has a very straightforward and easy to understand functioning. Moved by the wind, the wind turbine is the key element of the power stations of this type, because it use the air power to set in motion the internal machine components: it is generally composed by two or three blades, which have the up to the wind function: on the front of them, is generated an high pressure area, and on the back a low one: this simple physical phenomenon, causes the shovel is brought to leave the high pressure area and chase the low- pressure one; this mechanism leads to the rotation of the entire plant. The rotor then transmits the force to the ””tree” that sets in motion the electric generator: it is made up of magnets and a conductor wires wound in a spiral; the movement transmitted from the shaft spins the magnets around the wire coil, by uploading voltage and therefore electricity. It is therefore a continuous passage of forces, before from the wind to the rotor, than to the shaft and finally to the generator which activates the rotation and generates electricity. The same scheme can be applied to almost all the generators of this type so-called “horizontal axis rotation”. There are other types of devices, wind turbines with vertical axis, but they are less used because although they are more pleasing from an aesthetic point of view, are often less efficient.To move, a generator needs a wind of at least 3 meters per second, but it is only at 12 m/s that reaches the speed values it was built for. Beyond this limit the power increases in a less than proportional way, until stopping totally for safety reasons beyond certain limits.Before installing a wind turbine it is highly advisable to conduct a preliminary study on the historical data of the wind in that area and on the topography of the surrounding terrain. If it is true that the wind forces can vary considerably hourly, monthly and seasonal, it is equally true that the differences between years are actually pretty minimal; Moreover, it is good to consider if around the selected site may be disturbing elements such as houses, buildings, hills, etc. that can ruin the air flow. Nacelle. It is inside the enclosure which contains all the equipment needed to operate. It ”important for a better efficiency, that the nacelle axis is aligned against the wind: to do this in the larger systems this role is performed by a automatic yaw membrane, in the smaller ones instead it is sufficient the so-called “fin”, a kind of directional sail. Foundation and Tower. To perfectly support the structure and anchor it in an appropriate manner to the soil are required possibly reinforced foundations in concrete, which is usually for reasons and practical aesthetic are completely buried. On them the tower is applied, which is the connection between the ground and the nacelle. Other onshore parks. They are generally located within 3 km from the coast. Another type of wind turbine that is having a great success is the small wind (or micro wind): small generators useful to satisfy the most restricted needs. In Italy their diffusion is limited, also because of the legislation that contrary to what happens for the photovoltaic power stations, does not sufficiently encourage new investment by this side. As you can imagine, this type of generators’ cost are highly variable depending on the type of wind turbine installed. In Italy the average plant cost is given for a 30% from realization accessories services (value higher than the average of the European Union, also given by the special compliance of the territory), and the remaining 70% from the wind turbine’s components . The SMEA Engineering design for industrial installations ensures from this point of view, the right compromise for an excellent long-lasting result. The plants take up very little space, and the land around it remains fully usable for any use. Although quite thin, wind generators remain an obstacle for birds, hence care must be taken not to install them on the major migratory routes. Anyway, we must also say that the deaths of birds in this way are not even remotely comparable to those due to traffic or telephone repeating infrastructure.